This is a quick&dirty Mac OS X (10.2) port of Oyvind Hammer's wonderful old "mix" program (originally for SGI/Irix, ported to Linux by Guenter Geiger -- the version here is based on the more up-to-date Linux version). I wanted to have available a decent public domain soundfile mixing program for OS X, and I've always liked the simplicity and 'elegance' of Oyvind's app. So I took the Mac OS X audio parts of our RTcmix code and merged them here (thanks to John Gibson/Chris Penrose for that audio stuff!). NOTE: This version only does soundfile mixing, no recording, no MIDI, no plugins... but it does read all kinds of soundfiles (wav, aiff, snd, mono, stereo, etc.). 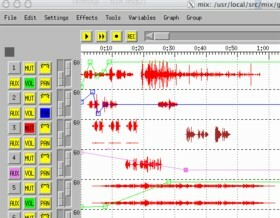 It can write out aiff files of the mix. This is also only for Mac OS X, no configuration or anything like that is necessary. Just type "make" in the top-level directory and it should compile. After successful compiling (or if you grab the pre-compiled binary version above), you will need to start the executable "mix" program from an X11 terminal window. Also, you will have to say "xrdb < Mix.ad" in that terminal window to set the correct app defaults for the "mix" program The "Mix.ad" file is in the top-level of the "mix" program distribution. For documentation on how to use "mix", see the "mixhelp.html" and "mixhelp-new.html" files in the DOCS/ subdirectory. I've also included some of the old README files and various copyright/GPL files because it seemed like the proper thing to do. Have fun -- make snazzy sounds!